A few weeks ago a friend of mine asked me about fertilizer- what do I use that isn’t harmful to humans? What type of fertilizer is best for the garden? The honest answer, like almost everything related to the garden, is that I have learned all about fertilizer from my Dad, Rob. So I reached out to him to write a guest blog post about fertilizer. Believe it or not, there is a lot to say on this topic so I have broken it out into two posts – 1.) how is fertilizer created and what you need to know to choose a fertilizer 2.) how to make your own fertilizer. Enjoy! First, I prefer organic fertilizer that is formulated for vegetable growing. Why organic? At a high level, using organic fertilizer actually creates healthy, rich soil rather than being a quick fix for vegetables. The post Preparing your garden beds for planting speaks to the importance of good soil in creating a healthy and strong garden. Organic soil not only feeds the vegetables but also is a food source for all the good things that you want in your soil like microorganisms and earthworms. When you look for a fertilizer, you may notice that most have an NPK rating of 10-5-5. What? Wait! What the heck is an NPK rating? I guess I need to start at the very beginning. Fertilizer is typically rated by three numbers. The first is the Nitrogen number, the second is Phosphorous and the third number is Potassium. All three of these numbers are important to the growth of your plants. The numbers are the percentage of those nutrients that are contained in that bag of fertilizer. Have you ever noticed how different fertilizer bags have different NPK numbers on them? Wouldn’t it be simple if every plant on this earth wanted the name amount of NPK to be healthy? Unfortunately nature throws us yet another curveball by giving us plants that have different needs. Typically you will see different formulations for vegetables and fruits versus flowers or starting a new lawn from grass seed. This blog entry won’t cover all the particulars on the differences, suffice it to say that vegetables like nitrogen for that nice green look on foliage and blooms but it needs root development and growth to be very happy. That’s why fertilizer for vegetables and fruits have more consistent numbers like doesn’t 5-10-5 as opposed to 28-4-4 for new lawn seed. Giving your plants too much of a good thing could actually burn the plants leading to a stressful situation or even death! So if you buy a fertilizer for your garden if you buy a fertilizer for your garden make sure it’s rated for vegetables and fruits and therefore has a fairly balanced NPK equation. Now it gets interesting. If you want the simple route, and aren’t frugal stop reading and go out and buy a decent brand (Meg uses homemade and Dr. Earth dry fertilizer) of all purpose organic vegetable fertilizer – your garden but not your pocket book will thank you. If you are frugal or a do-it-yourselfer, read on. To the readers – what are your favorite organic fertilizer brands for fruits and vegetables? Before you know it, your veggies are flourishing, and then you think, when should I harvest them? You are afraid to cut or pull too soon but also don’t want them to overgrow and then lose their taste. Be sure to take a little time to learn when you should harvest each of the veggies that you are growing. 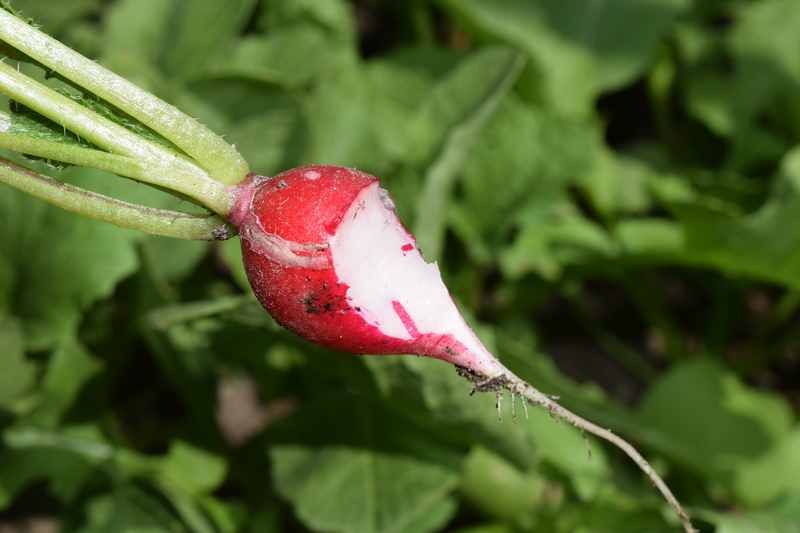 This is the first year I have grown radishes. Only a week after thinning them, they appeared to have doubled in size. I quickly realized that I may need to harvest them. 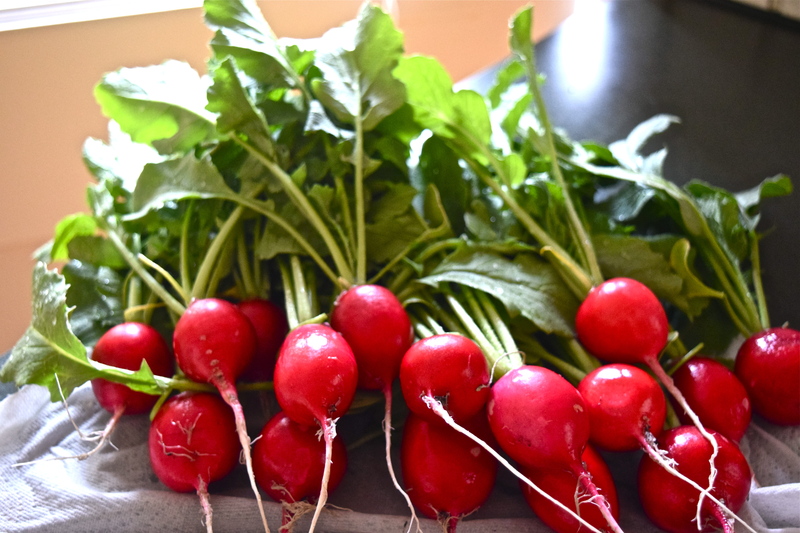 I referenced my favorite book, Square Foot Gardening, and learned to harvest radishes before they are the size of a ping pong ball. Looks like they are ready to harvest! Just to confirm, do a taste test with the first veggie harvested. I took one bite and the perfect balance of crunch and spice affirmed that it was time to pull them out and enjoy. 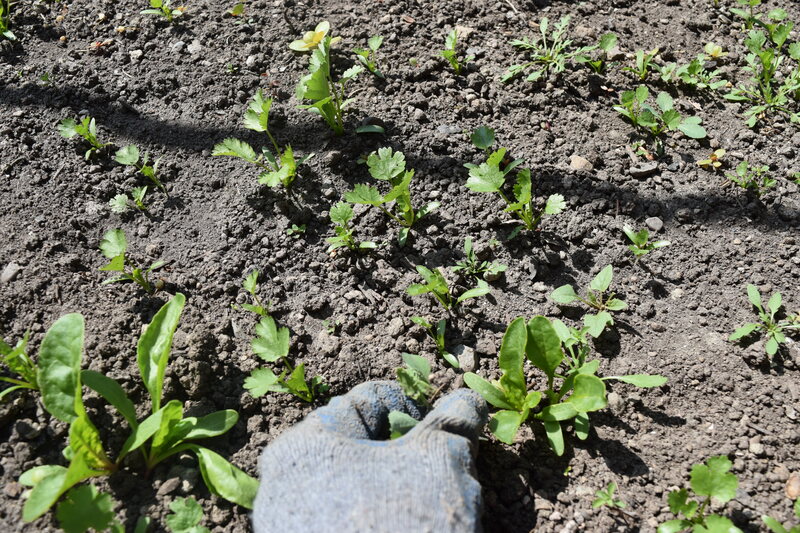 The moment I pull a radish or cut a leaf of arugula or pluck a zucchini, I feel a great sense of accomplishment and joy. Relish in this feeling and take in the beauty and taste of your very own creation!